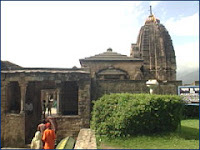 The Baijnath Shiv temple has been continuously under worship ever since its construction in 1204 A.D. by two local merchants named Ahuka and Manyuka. The two long inscriptions in the porch of the temple indicate that a temple of Siva existed on the spot even before the present one was constructed. The present temple is a beautiful example of the early medieval north Indian temple architecture known as Nagara style of temples. The Svayambhu form of Sivalinga is enshrined in the sanctum of the temple that has five projections on each side and is surmounted with a tall curvilinear Shikhara. The entrance to sanctum is through a vestibule that has a large square Mandapa in front with two massive balconies one each in north and south. There is a small porch in front of the mandapa hall that rests on four pillars in the front preceded by an idol of Nandi, the bull, in a small pillared shrine. The whole temple is enclosed by a high wall with entrances in the south and north. The outer walls of the temple have several niches with images of gods and goddesses. Numerous images are also fixed or carved in the walls. The outer doorway in the porch as also the inner doorway leading to the sanctum of the temple are also studded with a large number of images of great beauty and iconographic importance. Some of them are very rare to be found elsewhere. Baijnath lies on the Pathankot-Chakki-Manali National Highway No. 20, half way between Kangra and Mandi. It is about 130 Km from Pathankot, the nearest broad gauge rail head and airport. Kangra airport at Gaggal near Dharamshala from where small aircraft flies on alternate days to Delhi is 60 Km from Baijnath. There is also available a toy train from Pathankot to Paprola-Baijnath which runs on narrow gauge from Pathankot to Jogidernagar. 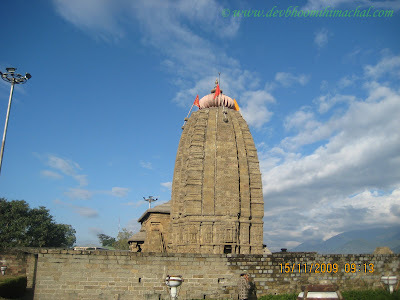 Baijnath is very well connected by all weather roads to Delhi via Chandigarh and to Manali via Mandi. Places of Interest : You can also visit Sardar Shobha Singh Art Gallary Andreta, Palampur, Billing, Bir, Barot, Gopalpur, Chamunda and http://www.baijnathtemple.com/nearbyPlaces.html etc.